I have long been an admirer of John Newton. He has written many letters and hymns that not only address my mind but also my heart. He was not a “speculative” theologian but an practical or pastoral theologian. He is one of my “long distance” mentors- stretching across both time and geography thanks to God’s providential gift of the printing press. While I am surely not the pastor (and Christian) I want to be, I am a better pastor because of John Newton. Tony Reinke has done people like me a great service with his contribution to Crossway’s series Theologians on the Christian Life. This is the first book I’ve read in the series. It makes me want to read more. But let’s look at Newton on the Christian Life: To Live is Christ. As Reinke notes at the end, he doesn’t say everything Newton does, nor cover every topic Newton covered. It would therefore be larger than the 4 volume Works of John Newton I also purchased recently. In about 240 pages, Reinke summarizes Newton’s view of the Christian life and then examines key areas like Christ’s All-Sufficiency, the Daily Discipline of Joy in Jesus, Gospel Simplicity, the Discipline of Trials and so much more. As the subtitle notes, the focus is on Christ, who as is noted above is All-Sufficient. Our Christian life is lived in union with the all-sufficient Christ. That does not mean he held to a view of Christian perfectionism. Newton made much of the reality of indwelling sin (there is an excellent chapter on the subject here). Too few pastors and theologians address this constant hindrance to our movement towards obedience. It is also the source of a steady stream of temptations. Any book on Christian living that makes little of this reality is fundamentally flawed. One of Newton’s other contributions is the stages of Christian life: childhood, adolescence and adulthood. Wise pastors should consider this as they preach and structure discipleship programs. This is one of the chapters in which Keller is mentioned often, as he is nearly as dependent on Newton as he is on Lewis. We need to help people see their own immaturity and what it looks like to become more mature in Christ and how Jesus brings us there. He includes a very convicting chapter on Seven Christian Blemishes. These are “respectable” sins that hinder our gospel proclamation and witness. He isn’t saying we aren’t Christians, but these attitudes and practices are sub-Christian. They are frequently a turn off to others. For instance, he mentions the one who quarrels about politics (I told you this was convicting). He was not against political involvement for he encouraged Wilberforce to stay in politics to put an end to the slave trade. The problem is people who are in no position to change anything (they are not politicians) and often lack sufficient information. Many people’s never-ending stream of political FB posts would fit here. These are rarely calls to prayer, or to contact your elected officials. This is one reason why some non-Christians are offended by our “politics”- not that we have views but how we express them or when we are ill-informed. The chapter on the Discipline of Trials is also quite important. Too few pastors really spend time talking about this. We then fail our congregations in preparing them for suffering well, with an eye to Christ above all. It is a lengthy chapter, and really needed to be lengthy. We all experience trials, and unless we have a solid theological understanding of the ways God uses them we will be mired in immaturity and grow bitter against God. The chapter on Christ-Centered Holiness was frustrating at points. I don’t disagree with what he said. I wish there was more. The focus is on beholding Christ as our Savior as well as our Pattern or Example. This is a very biblical idea (see 2 Cor. 5). Newton also talked about straining toward or agonizing toward holiness. He could have written more on this aspect of the pursuit of holiness. This is one of the best books I’ve read in quite some time. It is much like Newton’s ministry in that it is profoundly focused on Christ. It is filled with quotes from Newton to illustrate his points, many great encouraging quotes. He brings in some others too via quotes. This produces a very encouraging book. This is not just a book for pastors. Nor is it intended to be. Most Christians would benefit from this book. They will grow in their understanding of the Christian life, and therefore what God is up to in your life and how to grow up in Jesus. These are important things and Newton is a gentle but faithful pointer to Jesus. I think I could sum it up like this: as goes Mookie Betts, so go the Red Sox. 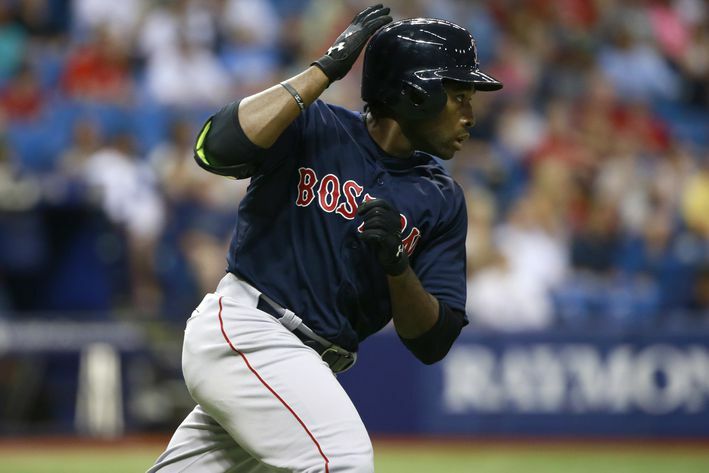 When he struggled early on, the Red Sox offense pretty much stunk. Even when the pitching was good. That surge before the All-Star break was led by Mookie Betts and Xander Boegarts. And Brock Holt filling in for Pedroia at second. This is not to put down Pedroia. His offensive production was all for naught prior to his injury. Out of the All-Star break Mookie & Pedroia were 0-30, Brock sat to give Napoli one last chance to start hitting and the Red Sox scored a total of 4 runs while losing 4 games. Early on they had problems in the outfield. Hanley was producing, in April and June. Victorino was invisible due to injuries. The most productive and consistent outfielder was utility man Brock Holt. JBJ and Castillo didn’t do much when called up. Some of that was because they were not used consistently. Hanley’s defense has been horrible. He should not be in left field, but the DH is being held down by Big Papi who has hit for power, and that is about it. I suspect the “pace of play” changes messed with his head. And an inconsistent strike zone. The Big Panda has been a big flop. He has made too many errors that cost the team too many runs. They lead the league in unearned runs scored, and possibly unearned runs allowed. At this point, it was a bad move to sign him. If you get to the playoffs, he’ll probably shine. But right now, I’m holding my nose. Napoli apparently hits much better w/out any sleep. He has been below the Mendoza Line all season. He had one great weekend, and that has pretty much been it. This is the last year of his contract so if they decide to, say, move Hanley to first they could get a better defender in LF, and some actual production at first. Or they could bring up Nava to play first. Or Craig who is at least hitting for average. The rotation is in serious disarray. Buchholz was on one of his amazing rolls when the inevitable happened: injury. Miley has been mostly good with some really bad performances that make him look worse than he is. Masterson: train wreck. Kelley: train wreck. Porcello started strong and has fallen into the abyss. Rookie Eduardo Rodriquez has been either dominant or horrendous. Not much in-between. Koji and Tazawa have been solid in the bull pen but they are about the only ones. Some of the problem is guys playing unusually bad (Napoli, Ortiz, Sandoval, Porcello), some inconsistent (Ramirez, Miley) and guys out of position. This is a poorly constructed team. And, yes, a poorly managed team. It is really hard to figure who is really constructing this team. Ben, Larry, Tom, John? There doesn’t seem to be a consistent direction with regard to free agents. They did great setting up the team for 2013. Other than that … horrible. I suspect Ben is doing what they want him to do. They need to develop a philosophy and implement it instead of trying to hit moving targets. A core philosophy that has minor adaptations year to year. They went big on contracts before 2011. Then short contracts brought about 2013. They tried that, with the wrong guys and too many rookies, in 2014. 2015 it was the return of the big splash. Sigh. Farrell has made some very bad in-game moves, and between game moves. Or maybe he’s being told what to do at times (play Napoli in Anaheim). If there is interference, it needs to stop. If he’s making all these bad moves, he needs to GO. There are some very good young players on the team. Xander has made some big improvements. He is hitting over .300, driving in some runs, and playing a much improved defense. Mookie plays the game the right way and he makes everyone better when he’s hitting. Brock Holt can play just about anywhere, and has hit over .290. He has desire too- he plays hard. I’m not sure what should be done. I do know you need a new first baseman. I do know that Ramirez needs to be moved out of left field. I’m not sure how you get this done. I’m not being paid the big money, but the ones who do better figure this thing out, and soon. Over the last year or so I’ve read a number of commentaries on The Song of Songs. Some of them have been good, and helpful (Gledhill & Longman), and some were not so helpful. Like Revelation (no “s” at the end) it is very difficult to interpret with the underlying principle making a huge difference. Various commentaries view the Song as a drama (literal interpretation), an allegory, and a collection of love poems seemingly w/out structure. Tyndale is updating their OT commentary series. This includes presentation or format (context, comment & meaning). I’m not sure I want to see some of those volumes replaced. In the case of the Song of Songs, they just released a new version by Iain Duguid. Based on his previous work, I knew I should get this and read it before teaching the Song in SS this year. I have one complaint: it is way too short. Of course it is a Tyndale commentary so it will leave you wanting more. Thankfully an expositional commentary by Dr. Duguid will be forthcoming. I don’t usually enjoy introductions for commentaries. I enjoyed this one, and found it quite helpful. Duguid approaches the song as wisdom literature. This is slightly more complex than it sounds. Throughout the book he notes words and concepts the Song has in common with Proverbs. Part of its message is a contrast with Solomon’s view of love and marriage (hundreds of wives and concubines). He often notes particular poems, but seems to also see them telling a story instead of disconnected poems. In the meaning section he ties it in to our relationship with Christ. He doesn’t do this in allegorical fashion, but by remembering that earthly marriage is intended to point us to Christ and the Church (Eph. 5). Allegory skips over the earthly marriage part. There were some very helpful comparisons and contrasts. He reveals some of the parallels within the book: thematic and structural. In the introduction he notes that at times one’s interpretation says more about you than the text. This is in reference to the sexual imagery. Some commentators see nearly everything as a sexual euphemism. Duguid is a bit more reserved. While not denying sexual imagery, he doesn’t find it everywhere like, say, Longman. This was a very helpful little volume. It is able to be read quickly due to its size. It is hard to find that balance between detailed enough to be very helpful and so detailed it becomes laborious to use. While at times I wished for more, I was not so inundated with data and ideas that I felt lost. I shall now have to go back over my curriculum and update it, possibly changing some of my conclusions. No study of The Song of Songs can be complete without this great little volume. In this case updating the TOTC was a wise choice.